Note: The following exhibit was published in February 2015. University Avenue, from the Cenotaph to Euston Street, reverted back to Great George Street May 6, 2015. 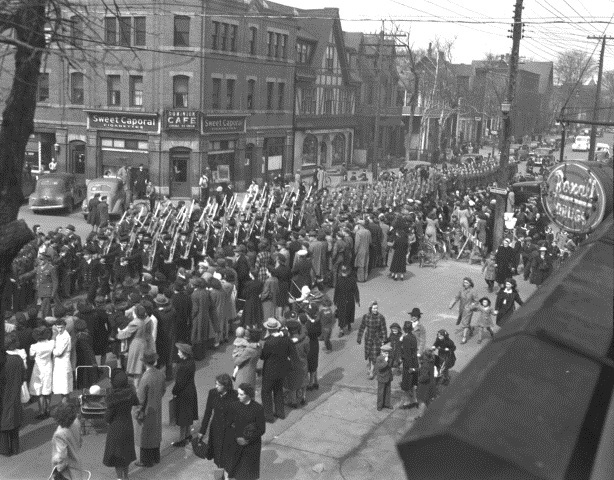 University Avenue was originally a continuation of Great George Street. It was named University Avenue in 1971 in honour of the “new” University of Prince Edward Island (est. 1969) that had been created from an amalgamation of Saint Dunstan’s University and Prince of Wales College. Due to its proximity to Queen Square and location on a route leading in and out of the City, it was developed early and contained both shops and services. Cobblers, newspaper offices, a dairy, pubs, barbers and beauty parlours, and cab companies were among the variety of businesses that called this area home. The Tweel Block was designed by local architect, James Harris and built in 1927 for businessman, Nemir Tweel (1889-1970), after a fire in 1923 had destroyed the building that had been on the site (the Guardian newspaper office). A large addition was built on to its north side in 1936. 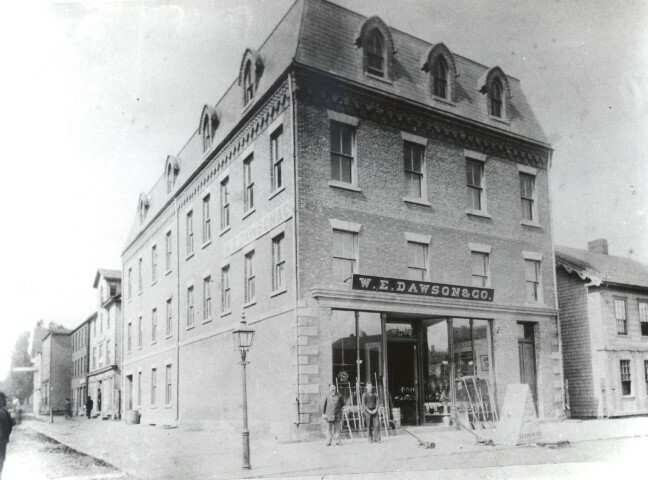 The Tweel Block became home to a variety of tenants including The Dominion Cafe, The Metropolitan, Singer Sewing Machine, Hambly & Innis Men’s Wear, a barbershop – where Tweel himself cut hair – several dentists and doctors’ offices as well as Tweel’s Gift Shop. More recently, the building has undergone an extensive renovation with the City’s first Starbucks moving in to the space in 2009. Other tenants would follow. 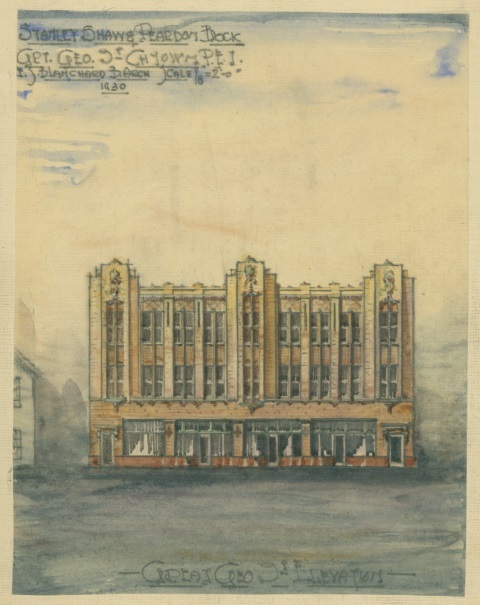 Further up the block, in 1930, a large brick building was designed for the plumbing, heating, and hardware company, Stanley, Shaw and Pearden by prominent architect, Edward Sterling (Bone) Blanchard. It contained a mix of residential space, offices, shops and restaurants. On the site of a gas station, the modern Atlantic Technology Centre was built on the south east corner of Fitzroy Street and University Avenue in 2001. The lead designers were Bergmark, Guimond, Hammarlund and Jones. Across the street, on the south west corner of University Avenue and Fitzroy Street, an old building, the former Pure Milk Company/Garden City Dairy had a factory and storefront where the public could purchase a lovely soft ice cream cone or ice cream float on a warm summer day. In the 1990s, the building was converted to the Playhouse, a popular nightclub that offered dancing upstairs and live music downstairs. After a renovation, J.R.’s Place opened in 2004 – the second business of the same name to operate within the City. In 2008, the building was renovated and converted in to the Old Triangle Pub which opened in May of 2009. A wide variety of businesses could and can be found along this section of University Avenue. Cedar’s Eatery was established in 1981 and Baba’s Lounge upstairs in the 1990s. Nearby, the Sportsman’s Club operates from a building that has a long association with billiards and restaurants. At one time, Frank’s Pool Hall, located upstairs, was a popular hangout for locals in the late 1960s but by 1971, the name had changed to the Charlottetown Billiard Club. 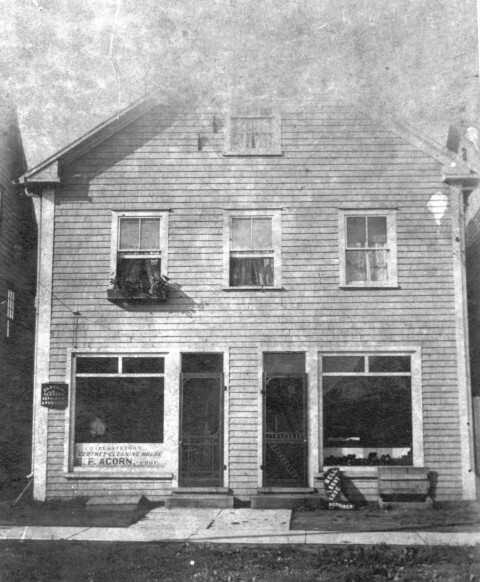 In the 1980s, local businessmen, who had an establishment on Kent Street named the Sportsman’s Club, moved their operation to the second floor of 75-77 University Avenue. Further south, a boarding house, taxi stand and a variety of other businesses have carried on their business from the building that now houses Back Alley Discs and the Downtown Barbershop. 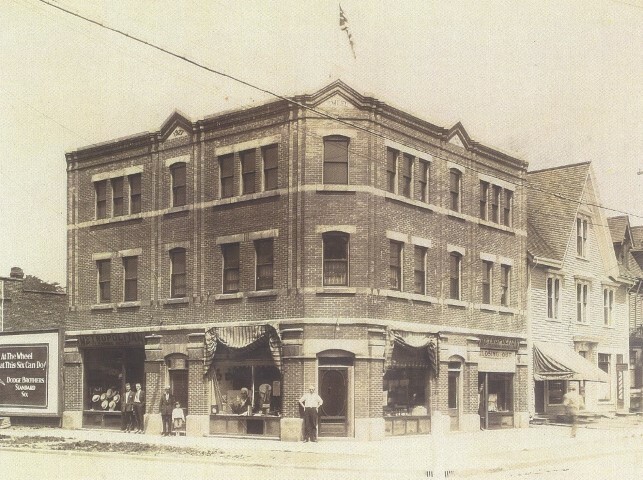 A c.1858 building where The Maple Grille is located, once housed a shoe repair and a taxi stand. The next building, constructed in the 1960s, was the location of the Bike Shop, a precursor to the Source for Sports located further out University Avenue. The last building along this tour section sits on the north west corner of University and Kent Street, and is currently undergoing a restoration with architect and developer, Chris Tweel in charge of the project. It was originally designed by well-known architect, Thomas Alley, for hardware merchant and former Mayor of Charlottetown, W.E. Dawson in 1881. Noted mason, Charles Heartz served as foreman of the bricklayers. Henry Smith, F. Damerill and John Cox were the principal joiners on the project. The Island Press stated that there was “not in these Lower Provinces a building better adapted for conveniently carrying on an extensive hardware business”. 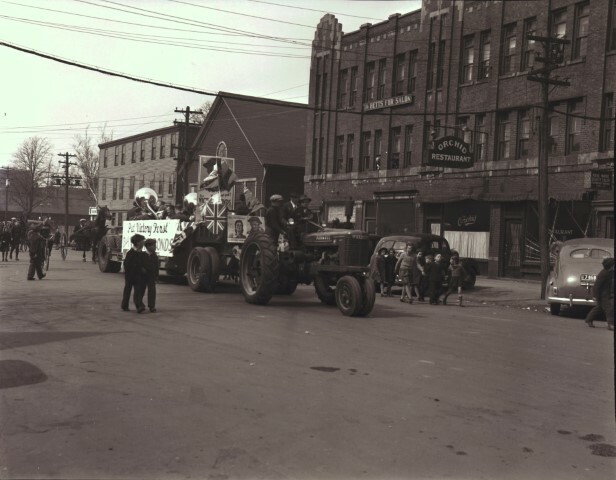 It has been home to a number of prominent businesses including: Stanley, Shaw and Peardon Hardware merchants, New Way Furniture, Lord’s Pharmacy, CFCY Radio, the Department of Agriculture and Sam the Record Man. The building’s exterior was modernized in 1975. In 2013, however, the 1970s siding was pulled off to reveal the original brick.